The clue is in the name. Rock Town (Rocheville) is a town to the North East of Briquebec in Basse Normandie. The commune of Rocheville contains a wooded hill to the South (Map opens in a new window) that appears to have been a megalithic quarry. 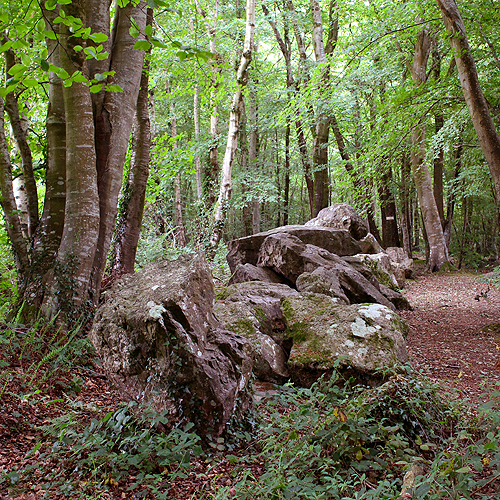 The Centre of the wood is filled with huge boulders and standing stones that are known as the Grosses Roches. 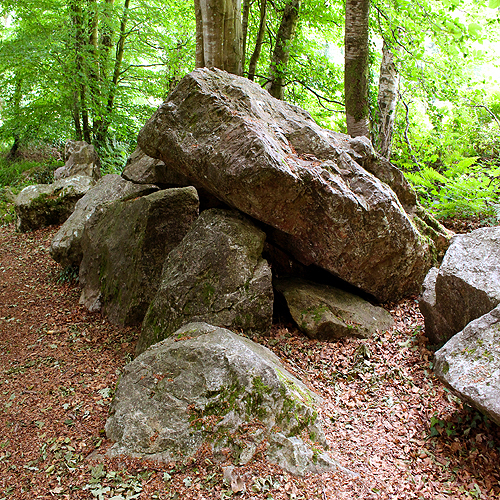 The Grosses Roches area is a cross between a sculptor’s gallery and a quarry full of megalithic possibilities. It looks like a sculptured rock park that has been used to explore natural forms of rocks and change them to newer versions. Then at some point work just stopped and was then abandoned. 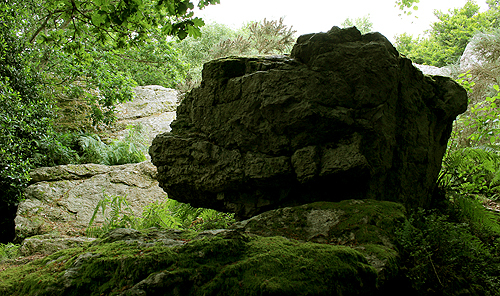 In Places you can see what appears to be destroyed covered ways, standing stones and grottos. 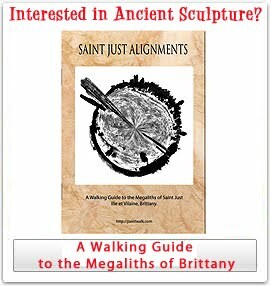 In terms of mystery this one rivals many of the megalithic sites in Brittany for weirdness. At a convenient parking spot near the woods entrance there is a picnic table next to the “Galerie Couverte de la Petite Roche”. This is an avenue of laid stones that was built as a burial chamber somewhere between the late Neolithic and early Bronze age. It is first mentioned in print when a bronze axe was discovered under one of the larger stones in 1827. A woodsman was clearing part of the wood when he found the bronze Axe. The woodsman sold it to a boilermaker in Cherbourg to be melted down. Luckily it was spotted by a local Doctor named Duchevreuil who purchased the axe and gave it to the Cherbourg natural history museum where it still resides. The Chamber of the Galerie Couverte de la Petite Roche is about 30 meters’ long and about 1 metre in height and 1 metre in width. The Stone lined burial chamber has been closed by a stone slab to the western end leaving the eastern side open. An entrance was placed about half way along and later an extension was added.This may have been done to add extra bodies to burial chamber. The majority of the top slabs that would have originally completed the tabled structure have been removed or destroyed. This neatly links to the other sites in this area because at least two other burial chambers have been recorded here, but only this one has been given historical monument status in 1906. 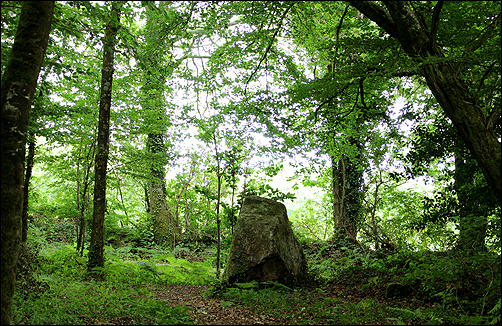 A circular walking route takes you through the centre of the wood to the Grosses Roche where you can find many standing stones and at least two other candidates for megalithic covered ways in this confined area. 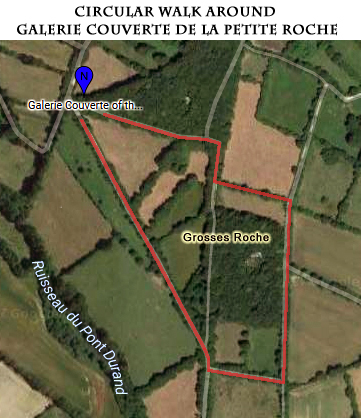 The map below shows the circular route starting at the Galerie Couverte de la Petite Roche and is an easy walk.